There are people whose potentials, when united, give highly effective results. 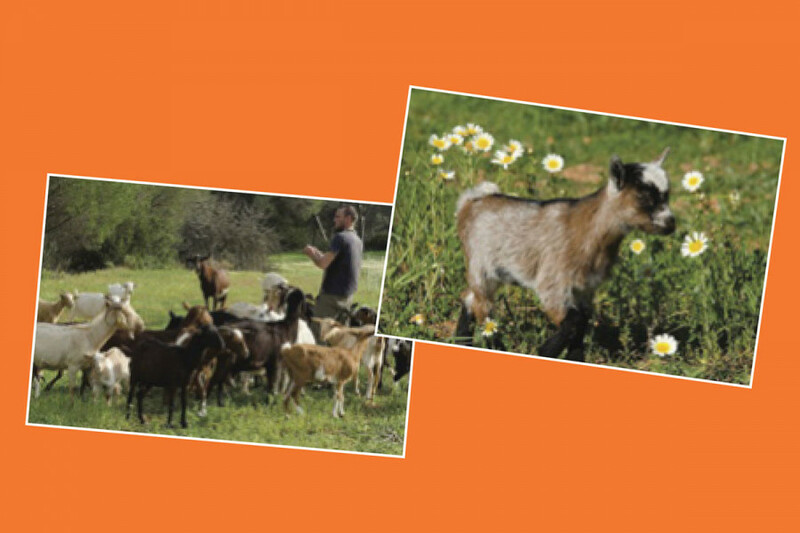 This is just the case for Sergio Oller, a migrating shepherd, and David Gamero, a forest engineer, who have created a fantastic enterprise dedicated to cleaning up the forests of Ibiza using goats. Four years ago, after the devastating forest fire in Benirràs, Sergio, who is dedicated to nature with heart and soul, decided to protect our island by setting up EIVINATURA. The main aim of this pro-ject is to prevent fires by eliminating the excess vegetation in our forests. What makes it special is that those in charge of cleaning up the vegetation are a herd of goats. No doubt the healthy appetite of these animals is the driving force behind this project, since goats can eat the equivalent to their own body weight in a single day. As well as protecting against forest fires, EIVINATURA offers other indirect benefits to the local community: one of them is recovering the native Balearic goat, which is nowadays in danger of extinction, and can be used to clean up the landscape; another benefit is the educational side of the project, as they visit schools to share knowledge about traditional shepherding and its associated values, so that new generations may get to know this ancient way of life which has nowadays almost disappeared. Sergio’s initiative was at last put into action after the fire at Morna that destroyed 1,500 hectares of land in the mountains of San Juan. 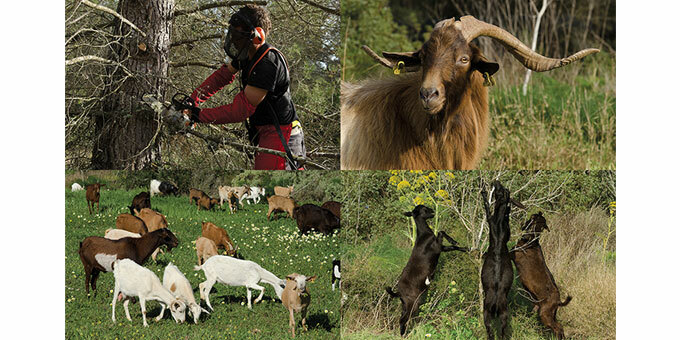 At this point, IBANAT (the Balearic Nature Institute), through its technician Alicia Medrano, decided to encourage the idea of cleaning up the forest using goats. At the end of October 2012, David and Sergio connected and created a small company with the hope of making this wonderful project happen. 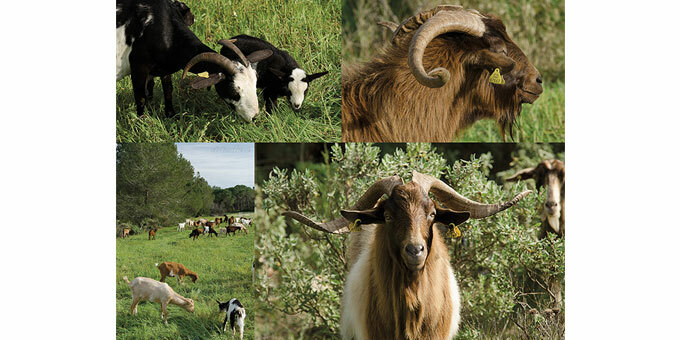 From the beginning they have made up a perfect team: a forest engineer who deals with the technical side of the business, developing the projects, presenting them and offering personalized options for each case, and a professional shepherd who cares for nature, knows his herd well and can organize the work so that it is carried out efficiently. The process to undertake a cleaning job begins with a visit to the area by an IBANAT technician, who comes with an Environmental Agent who will determine which type of permit is needed, depending on the work that is to be carried out. Once the permit is obtained, Sergio and Karim, migrating shepherds, set up a tent where the animals sleep and an electric fence to enclose the area that will be cleared, and after that they take the animals in. In this way, the herd carries out the work in a controlled way and always under the supervision of two shepherds who, as well as caring for and controlling the work of the animals, and thanks to their professional experience as forest agents, carry out the pruning and cutting of trees that have been selected previously. Any plant remains that the animals are not able to eat are shredded right there in the forest or taken away with a truck. The council of Santa Eulalia is the first on the island to have trusted the EIVINATURA initiative, by awarding them last October the execution of the first phase of a protection belt against forest fires around the urban area of Santa Eulalia, with a surface of 2.1 hectares, and another protection belt of 2.77 hectares in Cala Llonga, both of which are now active. On the other hand, IBANAT awarded them at the beginning of this year the clearing of a firebreak near Aguas Blancas and the council of San Juan is planning to award them the maintenance of a 5-hectare firebreak in that municipality. EIVINATURA is in constant contact with the Environmental Agents (AMAS) and IBANAT in order to advise and carry out protective belts against forest fires that can protect residential areas and private homes. Clearing vegetation with goats is perfect for this type of situation, because as well as being cheaper than other highly mechanized systems, the animal eats and defecates right where the clearing is taking place, which means closing the nutrient cycle – therefore, as well as clearing, the animals fertilize the land. Can you speculate on the Spanish inheritance tax lapsing?